Asheville Eye Associates recently presented LifeShare of the Carolinas with a check for nearly $15K . LifeShare http://www.lifesharecarolinas.org/ is the federally designated nonprofit organization that provides organs and tissues for transplantation and helps communities and hospitals through educational and support services in 22 counties in southwestern North Carolina, including Buncombe, Henderson and other counties in WNC. Last year the Practice dedicated its 2015 community fundraiser to LifeShare. The AEA staff sold t-shirts and a practice cookbook filled with recipes from staff, physicians and patients to raise money for the non-profit. Asheville Eye also planned and directed a 5K event, the 3rd Annual Run the Forest 5K and 1 Mile Walk held on September 26, 2015. Profits from the 5K and other 2015 fundraisers totaled just under $15K – $14,737.25 -and were donated to the organization. 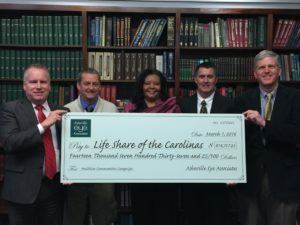 Debbie Gibbs, Public Relations Manager for LifeShare of the Carolinas, stated LifeShare plans to use the donated funds to support educational awareness programs in Western North Carolina to raise awareness about the importance of eye, tissue and organ donation. Pictured in the photo below are (L-R) Gary Burris, LifeShare Chief Operating Officer; David Marlowe, Manager, LifeShare Eye Services; Debbie Gibbs, LifeShare Public Relations Manager; Michael Haley, MD, LifeShare Medical Director; and Edward K. Isbey, III,MD of Asheville Eye Associates. 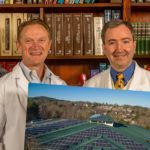 Dr. Isbey, III is also Medical Director of LifeShare’s Eye Bank in Asheville. Asheville Eye Associates 55-year history includes a culture of charitable giving. Traditional sponsorship of countless community events over the years has evolved to spearheading fundraiser and awareness events for the Susan G. Komen 3-Day Breast Cancer Walk (2008), and the first two Run the Forest 5Ks benefited non-profits the Low Vision Center in 2013 (which serves Western North Carolina) and the Guide Dog Foundation for the Blind, Inc. in 2014 (which provides guide dogs at no charge for sight-impaired individuals and disabled U.S. Veterans throughout the United States). Combined these three previous AEA fundraisers raised over $50K total for those non-profits. We are appreciative of the enthusiastic support of our staff and especially of our patients and our local neighbors who have participated and partnered with us to raise money and awareness for these vital community services!